Nagin Lake is considered one of the quieter spots of Dal Lake, perhaps because of its relative isolation from the other lake basins. There is an air of calm serenity here, and common photos of the lake include ones of the treeline, where water meets the banks lined with poplars, willows, and the occasional oriental plane tree. There are shikaras and houseboats such as those you would find in Dal Lake, yes, but certainly nowhere near the same quantity. 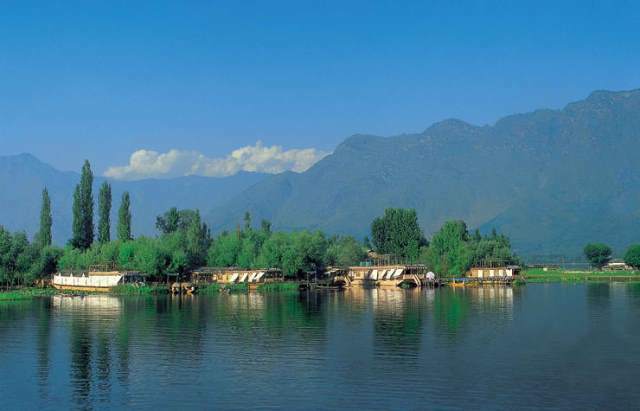 A look at Dal Lake’s shores can convince you that there might indeed be a thousand houseboats tethered to the docks. In Nagin, however, there are probably only about 200 all told. This makes the smaller lake preferable if you want a bit more peace and quiet than the ever-busy Dal can offer. Most people in the city shall actually advise you to swim in Nagin instead of Dal Lake if you are eager to take a dip in the waters, not least because the waters are generally less fraught with traffic. You would be less likely to get struck by a waterskier or wayward boat in Nagin because there are fewer persons in it. People also tend to recommend Nagin for water activities of this type because the waters are perceived to be cleaner, showing a clear, deep blue. Nagin Lake has its problems too, however: like many of the other beautiful lakes of Srinagar, it is afflicted with heavy sedimentation issues and siltation. As much as 30% of the sedimentation discovered in the basins, in fact, has been found to be of organic matter, compounded by the thick and untrammelled growth of weeds beneath the surface. Some of Srinagar’s lakes are being weeded regularly nowadays, and Dal Lake and its basins are getting attention from the local authorities for their plight too. People are being asked to do their part, of course, for a good number of the problems currently threatening the viability of the lakes for sustaining life in the future come from humans themselves. Bathymetric surveys and other studies on the basins are suggesting that if the current rate of sedimentation persists, the lakes may have only a few more centuries of viability, with Nagin’s projected years of usability being estimated to be less than 600 years. It might seem like a long time in the future, but given that these lakes could live so much longer than that if cared for properly, it is considerably short.